Carbon Arc Independent Cinema wants to expand to a bigger and more permanent space, but the process is difficult. “It feels like a good time. We’ve built a supportive and dedicated audience, which is fantastic,” Siloën Daley, director of Carbon Arc, said on Friday during the cinema’s final screening of the fall season. However, Daley said that she is still trying to find a suitable place and get enough funding. She said Carbon Arc gets its money through ticket sales and a grant from the province. Carbon Arc used to own its own cinema, but it closed 20 years ago. They still have the equipment in storage and have been working toward building another cinema, with a goal of offering nightly film screenings. As part of their current programming, the cinema has been running weekly screenings during the fall and winter months for eight years. It shares a space at the Museum of Natural History and, while Daley is thankful for the museum’s support, she hopes to have a permanent location so that they can show more films. The museum space has 74 seats and Carbon Arc sold out all but two of its screenings this season. “Not only do we show movies that show a variety of cultures and practices and everything, but we also have the habit of giving a platform to local filmmakers,” said Hillary West, a cinema volunteer. Last year they showed the film Werewolf by Nova Scotian director Ashley McKenzie, who also introduced the screening and held a Q&A afterwards. 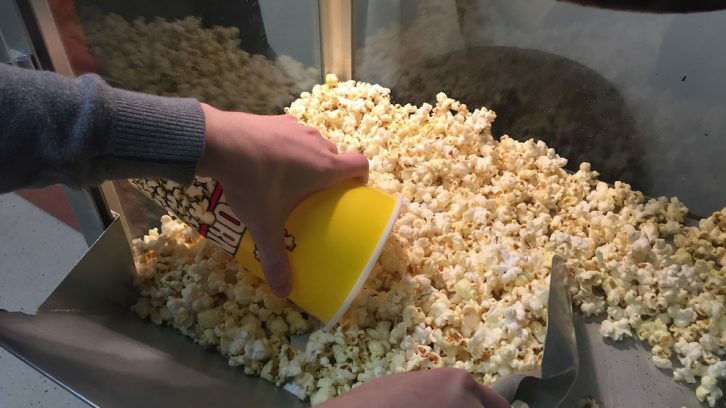 “We sell so many (tickets) online beforehand that the people coming to the door don’t get as much of chance to get in,” West said, adding that she often gives up her volunteer seat for customers. Daley hopes to find a space that offers 150 to 200 seats. She said she doesn’t want anything too big because she doesn’t want to lose the sense of community that people get from a smaller space. However, she said it’s difficult to find a venue that is over 80 and under 300 seats. The venue would also require at least a 12-foot ceiling, wheelchair accessibility and a booth room for the show’s technician. Daley said they are currently working with a consultant and have been doing more research towards the move. They’ve looked at different places, but one particular place that caught their attention is a space at the old World Trade and Convention Centre. A feasibility study is underway to re-develop the building into an arts hub. Daley hopes to rent a space there, if the project goes ahead. In October, the cinema invited people to join them in a discussion about their hopes to expand and they got supportive feedback. “I feel like they have a lot more to offer and maybe, if they’re in a bigger venue, … then some of these movies will get a bigger audience,” said Debbie Malbeuf, a regular attendee of the cinema, who was at the final screening. Daley said that she got a note from one of her audience members that said something like “just find a way to make it happen; we need you.” She stuck the note to her project book, where she’s working on finances for the goal.